Forty years ago today Armenians celebrated their first major soccer success in the USSR as Yerevan’s Ararat team beat rivals from Ukraine in a dramatic Cup final in Moscow. 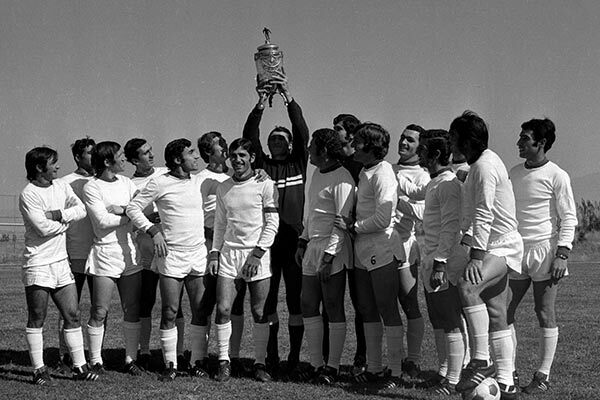 The match against Dynamo Kiev played in the Luzhniki Stadium on October 10, 1973, ended 2-1 to Ararat that later that month also won the championship trophy becoming a “double” winning team. Eyewitnesses of the event say that the victory was followed by unprecedented celebration as Armenians played ethnic folk instruments, sang and danced kochari at the stadium and beyond. Young or old, everyone was aware of the course of the game, the score, the names of the players participating in the match that didn’t bode well for Armenians in the beginning. Ararat were a goal down when Levon Ishtoyan scored an equalizer in the dying seconds of the second half, taking the match into overtime during which he scored the winner becoming an all-time legend in Armenian soccer. Rafik Petrosyan, a 63-year-old member of the National Assembly who taught at the university in 1973, remembers that he was in the Russian resort city of Sochi on business on that glorious day. Petrosyan says loudly rooting for your favorite team was frowned upon during Soviet times, but nothing could stop Armenian fans from expressing their emotions during the matches of their favorite team. Fan slogans are common nowadays but back then they were a new thing in Soviet Armenian reality. It was in the 1970s when Armenian fans first began to chant “A-ra-rat”, “A-ra-rat H’up T’ur”, “Ha-yer”, etc. during Ararat games, slogans that have survived, with some modifications, till our own days and are heard during national team matches. Meanwhile, in the times of taboos in the Soviet Union, a soccer game was a real oasis of freedom for many. “We took a little vodka with ourselves and had a shot every time our guys scored a goal. We cried and shouted, enjoying ourselves immensely,” says Petrosyan. Soccer in Armenia in the 70’s reminded of a special protocol. On match days huge queues formed at box offices, but most people as loyal fans had season tickets. Coming to the stadium even ten minutes before the start of the game was considered being late, as people usually came well before the kickoff in order to have time to discuss the lineups, the match officials, make predictions for the game, etc..
Fifty-six-year-old lawmaker Aram Manukyan remembers that when they watched Ararat games on TV back then they preferred gathering in large groups, including friends, families, to root for the favorite team. “Soccer was a national spirit. I remember two episodes when sports provided that – first when Tigran Petrosyan became the world champion in chess and then when Ararat scored victories in 1973. We had only the feeling of pride, dignity, and soccer was the topic of all conversations,” says Manukyan. It was the large following that Ararat began to have that made the republic’s authorities decided to build the large stadium in the Hrazdan gorge. The arena could seat up to 73,000 spectators and only during the 1973 season it was visited by more than 853,000 soccer fans. Sports commentator Slava Sargsyan, who was 25 in 1973, had a chance to be a commentator at Ararat games back then. He says the Yerevan team played soccer that couldn’t but be admired. “The entire nation was busy with soccer then. Ararat demonstrated high qualities, great team play, great techniques and tactics. Individually all were great players, but they were also great as a team,” remembers the commentator. Less then three weeks after beating Kiev in the Cup final, on October 29, Ararat beat Leningrad’s Zenit 3-2 at Hrazdan to become the champions of the USSR in the golden year for Armenian soccer. That success opened the way for the Yerevan team to perform at the international arena and two years later, in 1975, in a memorable match in Yerevan Ararat beat Bayern Munich 1-0. The German team then had many world champions playing, including one of the best defenders of all times Franz Beckenbauer. As years passed Ararat somewhat lost its winning ways to turn into a mediocre side in the USSR championships in the 1980s playing mostly to avoid relegation, but the winning spirit of the 70’s remained in Armenians and occasionally wakes up during national team games today. Writer, film critic, Honored Art Worker of Armenia, Professor David Muradyan, who chairs the Armenian National Film Academy, thinks that it was during the 1970s that the spirited play by Ararat prepared Armenians for the national-liberation movement in 1988. “It was that same generation that held their fists up celebrating Ararat victories in the stadium that stood in Opera Square years later… and then managed to resist and prove victorious in the Karabakh war,” says Muradyan. For Soviet-era dissident Paruyr Hayrikyan Ararat also symbolized the national-liberation struggle. In 1973, Hayrikyan had just been released from prison after serving a four-year term for his political views. The 64-year-old politician says that upon returning to Armenia he had an opportunity to watch Ararat play. “That was the year of the awakening of our national-liberation struggle. It was at that time that the strategy for independence through a referendum was adopted. I do see parallels between the successes of Ararat and the national-liberation struggle,” says Hayrikyan. The winning Ararat team included: coach Nikita Simonyan, goalkeeper Alyosha Abrahamyan, defenders Alexander Kovalenko, Norayr Mesropyan, Armen Sargsyan, Sanasar Gevorgyan, Suren Martirosyan, Arkady Harutyunyan, midfielders Arkady Andreasyan, Sergey Bondarenko, Hovhannes Zanazanyan, Sergey Poghosyan, forwards Eduard Markarov, Levon Ishtoyan, Nikolay Ghazaryan, Nazar Petrosyan.